Okay, so last weekend when I was boiling Marigold blossoms and getting a very pretty yellow dye on the stove top, I just had to start something else. 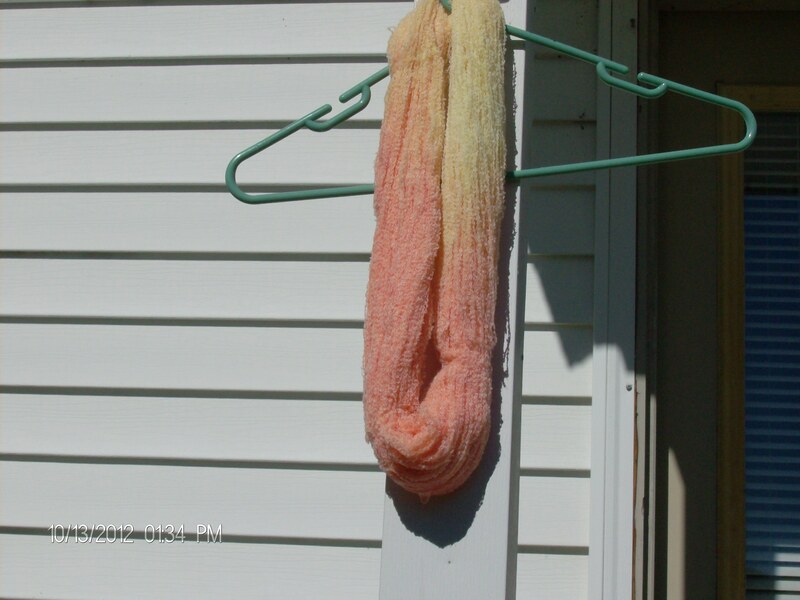 I loved the yellow dye from the flowers, but being an impatient soul I wanted some instant gratification so I pulled out the 5 packages of Kool-Aid I bought last summer with the intention of dyeing yarn. I first heard of this from a woman a the Goshen Fair a year ago. She had the loveliest green lace weight yarn and when I asked her if she had spun and dyed it she was more than willing to chat. It turns out that she had spun it, I am so jealous, but when she told me that she used Kool-Aid to dye it I was flabbergasted. Of course once I thought about it I remembered the mustache my son always seemed to have on his face when he was little and the clothes that were ruined by spilled drinks and it became crystal clear. 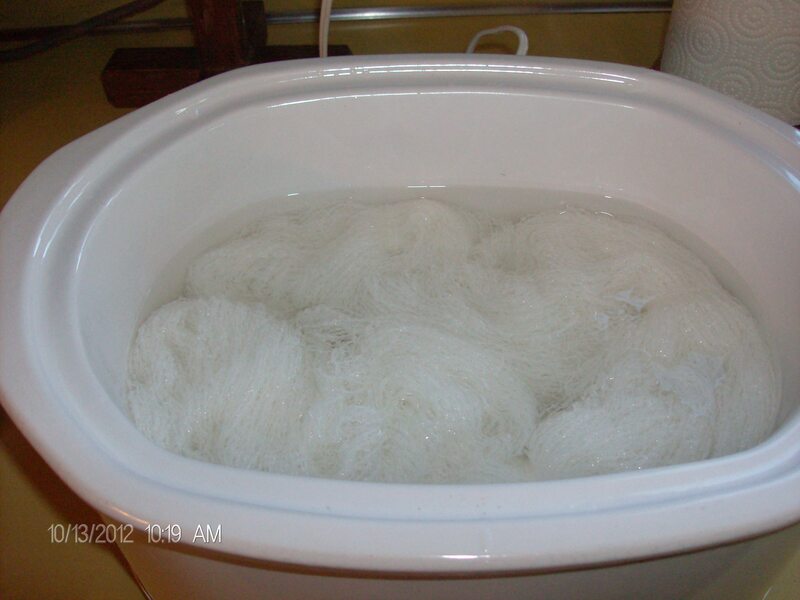 So I started out with a skein of the white boucle yarn that I dyed yellow and placed it into the crock pot I bought at the thrift shop specifically for yarn dyeing. The directions I had read to fill the crock pot 3/4 full of water, but I only went a little over half. I wasn’t confident enough that it wouldn’t wash out the dye altogether. Then I sprinkled a packet of Lemonade Kool-Aid on one side of the pot and a packet of Orange Kool-Aid on the other side of the pot. I then left it to perk for about an hour and a half on high to the most amazing results. Okay, I have to admit now that I am well and truly hooked on this dyeing thing. I lust after white yarns in different weights with which to experiment. I plan to harvest my red cabbage leaves this weekend and use up my red onion peels on another few skeins of yarn, but I really can’t wait to get more Kool-Aid and go for more intense colors. Really, it’s just way too much fun. Thank you. I can’t wait to get more Kool-Aid and I never thought I’d say that after the age of 50. 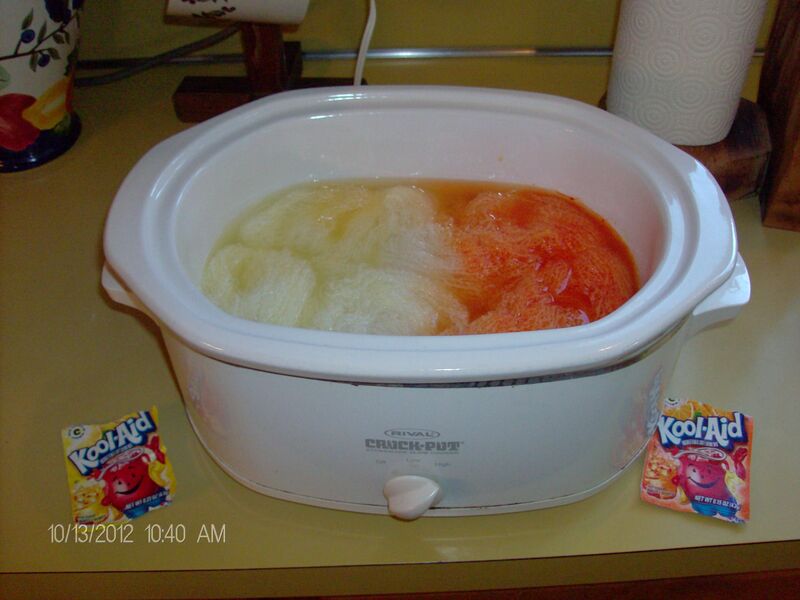 The good thing about using Kool-Aid is you can use your microwave with out worrying about the chemical issues or possible toxins from the various plants. I fear it may be addicting. uh oh now you’ve done it. Life will never be the same again! Love how this came out! It never occurred to me to buy a used crockpot for dyeing alone. I am going to experiment with what I have but, if I do it more frequently I will be investing in one of those thrift store finds also.